While we're waiting for lightening lemme tell ya about some of my other space adventures with the Atari 5200. 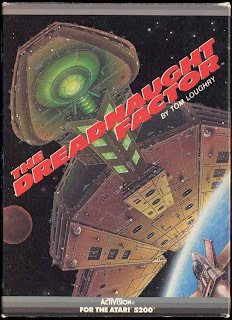 The Dreadnaught Factor is one of the earliest known scrolling shooters I know of and it , like many games of the early 80's, was influenced by Star Wars. The object is to fly your star fighter over a dreadnaught (Star Destroyer) and shoot the gun turrets, and bomb the exhaust ports...presumably with proton torpedos. You would get multiple fly-bys to destroy the Dreadnaught,bombing the engines would slow or stop the massive ship which would make it easier to accomplish your mission. The first dreadnaught was a blatant ripoff of a star destroyer but the designs did vary after each destroyed dreadnaught. The game was designed and programmed by two guys and published by Activision. Imagine what a game on the PS3 would be like if only 2 people made it!? Nowadays the credits at the end of games like MGS4 and FFXII read like a movie and in some cases have bigger budgets. The Dreadnaught Factor contains all the core elements of scrolling shooters such as the recently released 1942 Joint Strike. It's kinda cool to think that a game created by two guys 25 years ago still shows it's influence in games today. The graphics might have been simplistic but the gameplay was enjoyable and the game handled well, and in my opinion that's most important. Just because a game looks fantastic doesn't mean it will be fun to play, that's something older gamers know from these old school titles.